Diva, I am completely stumped on this one. I was told that wood flooring looks nicer and will make my floors worth more than going with laminate flooring. Is this true? Should I go with the extra expense of hardwood vs laminate flooring? My kids are all moved out and it’s just me and my wife. Thanks. When companies put that much effort into the laminate flooring, they make it difficult to tell the difference between actual wood and laminate when you see the flooring actually installed. Keep in mind that not all flooring companies are created equally and some will look more realistic than others. If you’re considering laminate but want to make it a dead ringer for wood flooring, considering going with a product that has that Embossed-In-Register technology or one that comes in a plank size that looks like one individual piece of wood. Because of the added depth both of these features create, it will be nearly impossible to tell it’s not real wood when the flooring is installed. 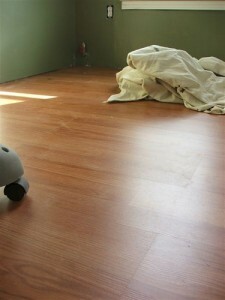 As you can see, laminate can look like real hardwood flooring. It just depends on the brand and type of wood species you’re looking at. Laminate flooring doesn’t add value to your home like wood flooring does though. That part you were correct on. 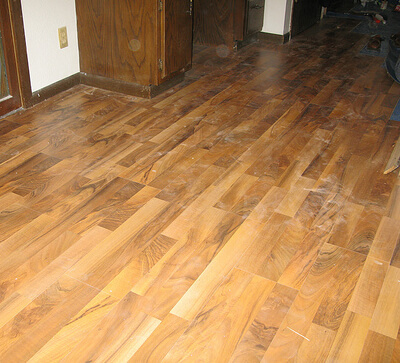 If you were having your house appraised, the value would be greater with real wood flooring than with laminate. That’s not to say that laminate won’t increase the value of your home some, just that wood would increase it more. While hardwood flooring does increase the value of your home, some people shy away from it. Especially families with kids and pets. In this instance laminate would be a better fit. If you have large dogs I’d stay away from hardwood and go with laminate because it can take a beating much better. If you don’t have dogs or grandchildren visiting, then hardwood is definitely worth the extra expense as it will feel more solid than most laminate floors. Just remember not all hardwoods are created equal and some are harder than others. The harder wood floors are generally more expensive and often people have a love hate relationship with them. Because sometimes the harder woods are also only found in darker colors. One thing to remember about darker color woods is that they are harder to keep clean. This is especially true for the glossier finishes. So if you live in a dusty climate, stay away from darker wood floors because you will see every speck of dust. A few tips to keep in mind before you purchase any hardwood flooring is that not every wood flooring product in the same wood species will be the same “hardness”. Just because it’s Brazilian Cherry from company X does not mean it is the same hardness as the one you saw from company Y. There are many variables to consider from manufacturing process to how old the tree was when it milled to where the tree is from. All of these things will affect how tough the wood is. No matter what type of wood flooring you are looking at, you should do your research and read reviewers comments for each product being examined. I’m not trying to keep you away from purchasing hardwood flooring John, rather trying to make sure you are informed and know what to expect before you buy. One great test to do this is the key test to test how tough the wood is. Get a sample of the flooring and lay down flat on the floor finished side up, then hold your car keys at shoulder height out from your body and drop them on the flooring. Then examine the flooring to see what kind of marks the keys made on the board. Now you will know what to expect if the flooring should get any damage from day to day life. In fact this a great test for any flooring you decide on whether it is laminate or wood.